Most embroiderers hit you with add on costs like digitizing, art fees, set ups, per stitch charges. 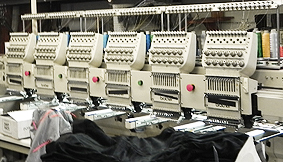 At San Jose Embroidery, you get all your costs up front so you know exactly what you will pay. If your digital conversion is bad, your design will never stitch right. Our digitizers have been in the biz for decades. We only work with the best of the best. You see it stitched out before we begin! Nothing can make you pull your hair out like not having your order when you need it, for an event of occasion. You will have a firm delivery date as soon as you approve the stitch e-proof. This is a firm date that we will hold to. At San Jose Embroidery you can count on us! No real Artists to help You? 1. PICK! your garments from our online giant San Jose Embroidery catalog and email us sales@sanjosescreenprinting.com your choices, along with sizes, quantities and colors. Be sure to include your name and contact phone. 2. PAY! your San Jose Embroidery online invoice when it arrives. 3. SEW! We’ll digitize your art and send you an E-Proof for your final approval. Then we’ll embroider your shirts. Ready in just 5-7 days after you approve the order. San Jose Embroidery sells and sews on: shirts, caps, jackets, Aprons, corporate wear, dress shirts, polo shirts, bags, towels and much more. We embroider for individuals, corporations, small businesses, clubs, show, events, parties, gifts, car clubs, sports teams, golfers, Uniforms, All our embroidery is done In San Jose, California.